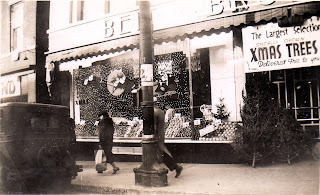 Beit Bros. Super Markets, Inc. was a family owned and operated company serving eastern Connecticut from 1908 to 2008. Known throughout the community for quality goods and services for generations, our primary origins began in the cattle business, opening our first meat market in Norwich in the early 1900's. Shortly after, Beit Bros. expanded into supermarkets. Family, community, and tradition were the staples of our business. Beit Bros. had come a long way since the old meat market started by Samuel and his sons Nathan, Max, and Louis. This success would not have been possible without the lessons of hard work and giving back to the community. These lessons were passed down from generation to generation. Our family business started in Norwich, CT. The first meat market was on the West Side. As our business grew, we added locations. This photograph was taken in front of our "Super Market" on Franklin Square, right at the heart of the city. There was once a time when eveyone went "Down City" to do all their major shopping . . . food stores, clothing stores, banks, department stores, restaraunts . . . and Beit Bros. was in the middle of that hustle and bustle. Copyright Eric Beit. Simple theme. Theme images by luoman. Powered by Blogger.